Posted on January 24, 2019. Subscribe to our blog by email. On December 6, more than two hundred women eagerly awaited the start of what promised to be an inspiring and emotional event. Braving the cold, dark morning, they were greeted by the uplifting music of the Seattle Women’s Steel Pan Project, perfectly complementing the energy in the room. Kristen Dailey, executive director of Global Washington, welcomed the attendees. Afterwards Michele Frix, chief of staff at The Seattle Foundation, and Kathleen Steffen, deputy director at the Seattle International Foundation, talked about the founding of Women of the World, and how the “visionary leadership of Bill and Paula Clapp” had been instrumental in its creation. After eight years under the stewardship of the Seattle International Foundation, going forward the annual event will be run by Global Washington. Steffen symbolically handed Dailey a sparkly purple baton to mark the transition. “We are so happy that Women of the World has found a new home with Global Washington,” Steffen said. The transition came about after a shift in strategy by the Seattle International Foundation, which will focus its efforts in Central America. Dailey acknowledged the many philanthropists in the room, and thanked the host committee and sponsors for their help in making the event possible. Dailey also recognized 10 featured non-profit organizations who were profiled in the 2019 Global Philanthropy Guide. A copy of the guide was given to each attendee. As a past attendee, Dailey said she “know[s] how much women look forward to it every year,” and she was honored that Global Washington could continue the tradition. After Dailey’s remarks, Emer Dooley, the Ashesi University board of trustees representative, introduced the first keynote speaker, Yawa Hansen-Quao. 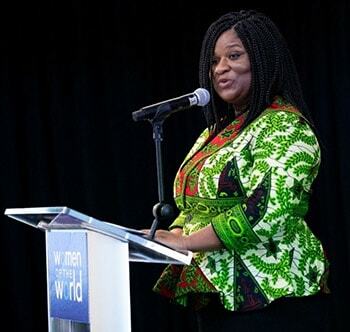 Hansen-Quao attended Ashesi University in Ghana, and currently serves on the board of directors. She is the executive director of Emerging Public Leaders and the founder of Leading Ladies’ Network. Hansen-Quao described her “evolving leadership journey,” and discussed areas where philanthropists might want to focus greater attention. Despite her parents’ desire for her to go abroad for university, something about Ashesi resonated with her. “There’s something powerful about being in an environment where you are taught to think critically about your role in society,” she said. Less than 5% of Ghanaian women at that time attained university-level education. Despite the odds, Hansen-Quao not only attended Ashesi, she ran for student president. “I simply believed I had the best ideas and could get the job done,” she said. Her election marked the first time a woman had been elected to a university student body leadership position at the university. After Hansen-Quao concluded her talk, Fidelma McGinn, The Seattle Foundation’s chief philanthropy officer, took the stage to introduce the program’s featured philanthropist, Suzanne Sinegal McGill, co-founder and president of Rwanda Girls Initiative and an advisor to the Sinegal Family Foundation. The ultimate example of McGill’s efforts to overcome her fear and break through was her decision to build a school for girls in Rwanda. Since its founding, Gashora Girls Academy has had 528 graduates, and a 95% graduation rate. Of those who graduate, 90% end up matriculating to higher learning, compared with 6% in the country as a whole. Next, Global Washington board member, Melissa Merritt, stepped up to thank McGill and the other global philanthropists in the room. Merritt explained how Global Washington intends to support them on their journey. 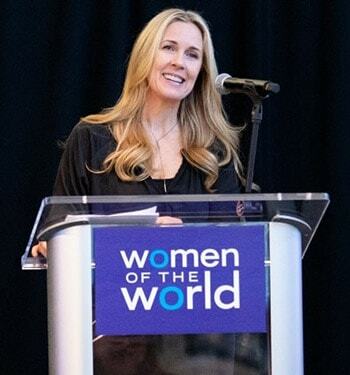 Kristen Dailey provided the closing remarks, and described some of the upcoming Women of the World events Global Washington had planned for local philanthropists, as well as opportunities where they could help shape future events by serving on the steering committee. “This is meant to be an initiative by philanthropists for philanthropists,” she said.